J.C. Penney stock (JCP) fell Friday on the back of the retailer's quarterly results, but technical analysis shows the stock will rebound in the short term. Here's how to profit. J.C. Penney (JCP - Get Report) shares slumped Friday after the company reported quarterly results, but the stock is poised to bounce in the short term, and we'll look at a way to profit from such a move using stock options. The retailer reported results on Friday before the stock market opened. Although its loss per share was narrower than expected, revenue missed analysts' estimates, and the stock closed Friday down 2.8%. J.C. Penney's results weren't nearly as negative as Macy's, which reported earlier in the week, and J.C. Penney shares are likely to correct higher in coming sessions. Penney, like many old-style retail stores, is losing the battle with online retailing. Even so, its recent price action and the earnings news appears to offer a short-term trading opportunity. The chart above reveals three strong bullish reversal signals. First, the long-legged doji appeared before earnings day after a long price decline. The gap on Friday took the stock's price lower, but during Friday's session the price came back from the opening level of $7.36 to close at $7.58. 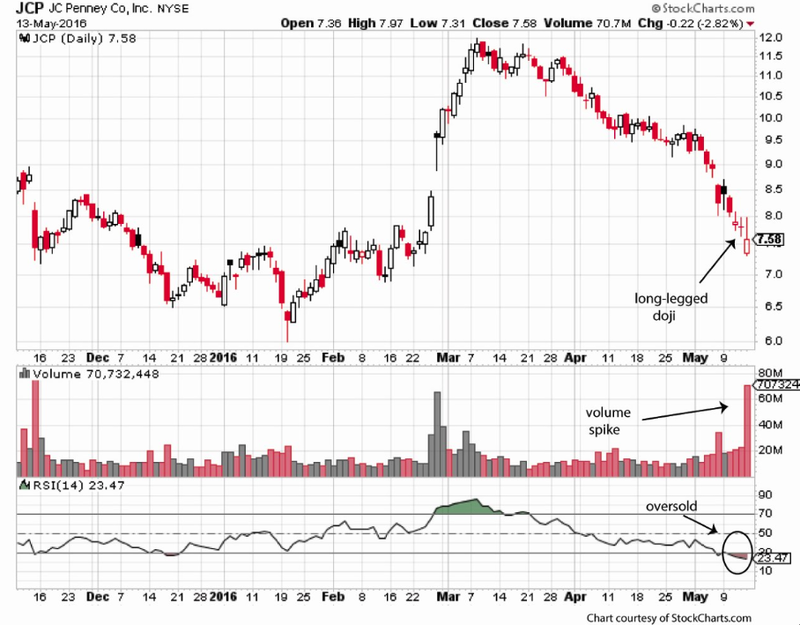 The second signal was the large volume spike, something that is typically associated with a reversal. It also confirms the first signal. The third was a change in momentum, as measure by the the relative strength index. It moved into oversold territory (defined by a reading of less than 30). Collectively, these three signals forecast a reversal and bullish turn to occur in the short term. The expected turn should take J.C. Penney's stock price to or above $8.50, which is around the level where the the stock opened on May 9 following a downward gap in the previous session. With this in mind, consider purchasing the May 27 weekly options, which expire in 11 days. The 7.50 call option was in the money by 0.08 points, and the price is low. It closed on May 13 with an ask of 0.42. After adding transaction costs, this can be bought for approximately $53. With even a slight bullish turn in price, this options contract could become profitable very quickly. Michael Thomsett blogs at TheStreet.com, Seeking Alpha, and several other sites. He has been trading options for 35 years. Thomsett Publishing Website -- he has also published a paper in the current issue of the Journal of Technical Analysis (JOTA) challenging commonly held beliefs about market efficiency and poses a trading system that can beat the market.